Can be inserted Video Card (DVC-6432) – Up to 16 cards (1 card of DVC-6432: 64-Input, 2-Output). Can be connected 3 of Video Input extension bay units (Processing of 64 Camera Inputs), control up to 256 Cameras. With DCK-255 (matrix Controller Keyboard), it can be controlled, up to 8-Sub Keyboard. Built-in function relayed Alarm system (DAR-080, DAR-241), it can be input up to 512 Sensors. Can be connected P/C directly due to built-in RS-232 Port. Video Matrix Switching System can switch any video inputs to any of the video outputs (monitors, picture storage units, video printers etc.). It connects the associated camera to the alarm monitor in the event of an alarm. 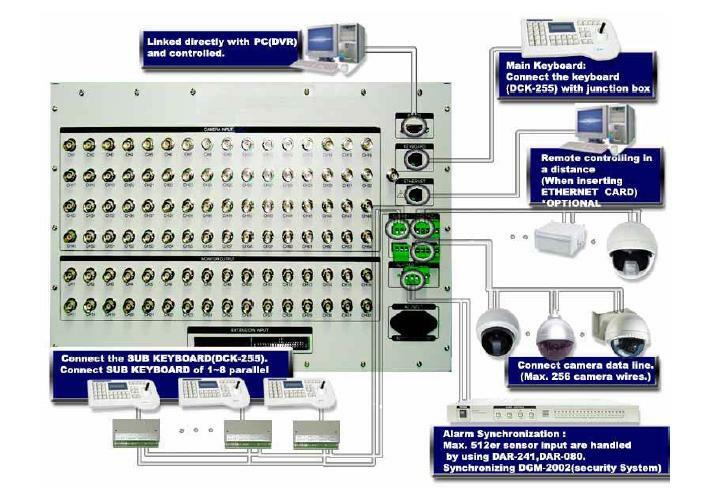 The alarms can be applied to the Video Matrix Switching System as a contact or a message via the system keyboard. In addition to the switching of pictures, it is also possible to remotely-control PTZ cameras including preset positions. On-screen displays are possible for the time and date as well as text inserts for identifying cameras/alarms and definition of camera sequences.